I am very excited to be joining in this challenge with other jewellery artists around the world. It is a wonderful opportunity to explore new designs, challenge myself with new techniques and to develop new Work. 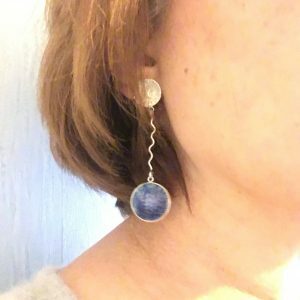 I love wearing earrings but I don’t seem to sell as many as other items. 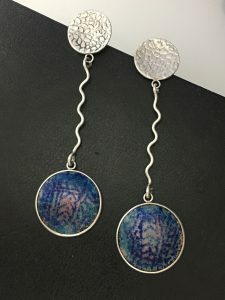 I think I have maybe tried to make designs that I think people will like rather than making earrings that I love. I intend to remedy this and hopefully other people will love them too! Here is pair number 1. They are part of my Indian Memories range and incorporate enamel on copper with a screened design and a Matt finish. These are set in silver with silver drops and studs. They are partly inspired by the work of Wendy Ramshaw who was on last months cover of Crafts magazine. The reverse of the setting has the same texture as the top disc with the ear post. Thank you Hilary. So glad you like them.